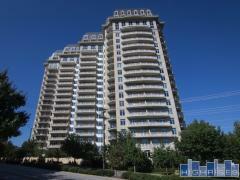 The Terrace is a mid-rise condominium development in the Victory Park district of Dallas. Built in 2007, these homes feature all the modern amenities you would expect, like granite counters, stainless appliances, wood floors and big windows. Building amenities include a pool, deck, fitness center, 24-hour security and concierge. There's also a large park adjacent to the property, and the House of Blues and American Airlines Center are just steps away. Have any comments or questions about Terrace Condominiums? Ask your question and/or share your thoughts about this Building.